Hello and welcome to another video in our WordPress series! In this quick video I’ll be showing you how you can embed video or audio in your posts & pages in WordPress! This can bring a new look and feel to your website which your visitors are going to love. So, let’s dive right in! Nothing connects as deeply with your ideal prospects as how video does! You can literally video blog about anything that is important to your audience. So, many businesses use video to share tips and tutorials just like this one to connect with their customers. These types of posts help increase their customers’ knowledge, enjoyment, and overall trust in your brand. People love to see and hear who is behind the brand. Video is perfect for helping you achieve this! The easiest way to embed video onto your own site is to first upload your video to a video hosting service such as YouTube. Once your video has been uploaded and converted successfully, it can be embedded within a post or page on your site with just a couple of clicks! All you need is the embed code. So for example, if you’re using YouTube, the embed code is found under the video where you can find the Share tab. Then select Embed. You can then paste the embed code into your WordPress site in it’s proper location. Yet, there is an even easier way to do this using the auto embed feature in WordPress! All you need is the video’s URL. So, be sure to copy that. If you’re on YouTube, just click here and the URL of the video will come up. Then go back to WordPress. Create a new post and gave it a title. All you do is paste the URL anywhere into the main body and WordPress embeds the video and gives you a preview of how the video will look! How easy was that? This works for Vimeo, YouTube and even videos on Twitter! If you click on preview, you’ll see that it’s looking great and not only has WordPress embedded the video for us, but it’s also resized it so it fits correctly! As I said, this works with other services such as Vimeo, Twitter, YouTube, Soundcloud, Spotify, Ted, and more. To see a list of all the services that support the auto embed feature, you can see them in the WordPress codex guide, here! If, for any reason, this auto embed feature doesn’t work or you want to control the size of the videos, you can manually embed them using the embed code! This code can be found on your YouTube video page under the Share tab > then click on Embed. You can also choose a size you want from the dropdown options. I suggest un-ticking these options because it makes your video look cleaner and less cluttered on your website! Now copy the embed code and head to your new post or page. Before pasting the code, make sure you’re in the Text view. If you were to paste it in the Visual view, WordPress would just show the code and not the video. So, it’s important to be in the Text view! Once you have pasted the embed code, you can select the preview option and you’ll see your brand new video! So, now we know how to embed photos and videos in our posts & pages. 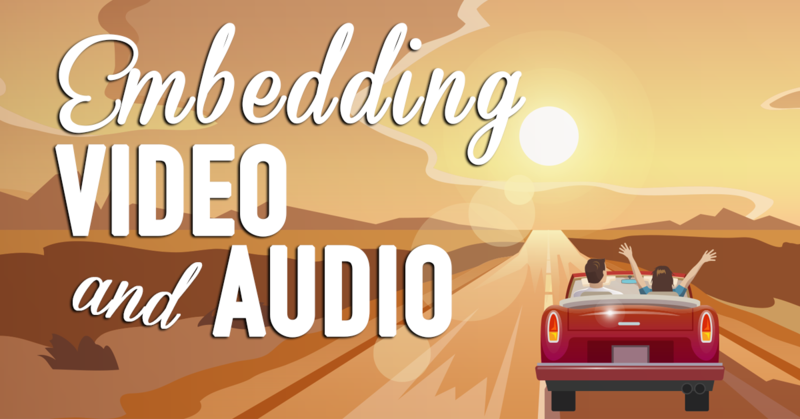 I’ll now show you how to embed audio on WordPress. It’s easy! Head to a new post or page. You’ll see mine that I’ve just created. I’ve got some audio files on my desktop that I want to use. All I do is drag and drop the audio into the main body of the post or page, and WordPress automatically uploads them. Once they’re done uploading, I choose “Create Audio Playlist” and then “Create a New Playlist”. Just like when creating a photo gallery, you can rearrange the audio to how you like. You have a few playlist options here. Once you’re done, click on Insert, and as you can see, WordPress creates a playlist for us! If I preview this new post, it’s looking great, and my new audio is working! We’ve now got some great looking photo galleries, videos, and audio playlists on our website! In the next video, I’m going to show you some tips on using the Media Library effectively! I hope you enjoyed this video. If you did, please give it a quick like and share it with your friends! Thank you and see you in the next video!